Load Brahma once had a gathering where he invited the demons first, to show them honor. They were sitting in line. Brahma then told them that they were not allowed to bend their elbows, even while eating. The demons tried to eat, but ended up getting food everywhere. It fell on their face, nose, Mouth, and clothes and they couldn’t enjoy the food. Next Brahma gave the feast to the angels. They sat down and knew they were now allowed to bend their elbows. So they fed each other ! And they had fun with it. Being for each other is the ecstasy, it is the divinity. And being for yourself is the tragedy. Self is for serving others. 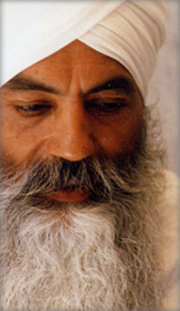 - Siri Singh Sahib.